I love that this bedding is light and not heavy. I absolutely love that it is reversible. In the picture I have it on the cream side tucked into the bed. You really can make this bedding look different in a bunch of ways. I have had this for over two years and the stitching has held up. Really impressed with this bedding. Design with style and comfort in mind, the INK+IVY Kandula Coverlet Set provides all the elements of a unique, casual look for your bedroom. The rich, mustard yellow color is accentuated with dark quilting featuring adorable elephants and flowers. The reverse side is a lighter off-white color while the quilting remains dark colored for a completely different look on the reverse. Get two different looks for the price of one coverlet. Whether you are using this coverlet as a layering piece to your current set or as a focal piece all on its own, the Kandula collection is sure to be a hit in your space. Euro shams and decorative pillows shown in the image are sold separately. Dimensions 92.0 In. X 88.0 In. X 0.25 In. This coverlet set was far better than I imagined. The fabric is soft and the stitched design is perfect for our master bedroom. I liked it so much, I bought it in the seafoam color for our guest bedroom. It's a winner! In the accompanying picture is the coverlet set, nightstand and rug all purchase thru Overstock. The color worked for me. It was perfect. The "heft" of the coverlet was equally perfect. Website did not have the size for this piece, and support never called me back. I ordered 13 of them for my lodging property - and gambled that it would be right. WAS IT EVER. I like bed spreads that cover the pillow, but I can work with this. Love the subtle detail with the elephants. Kind of matches my '50's vibe. It has been hit or miss with overstock in the past. Sometimes quality is sadly lacking, but more often than not, it turns out well. LOVE this set!!! The color and fabric are just as pictured. I love the reversible aspect of this coverlet. The only reason I did not give it 5 Stars is because I wish it were about 5 or 6 inches wider and longer. I have a King size bed, NOT a California King and for me, it could be a little more generous in size. That being said... In all fairness, I do not remember if they gave the dimensions of the coverlet, and I didn't measure my bed to be sure it would fit well. I should have done that and recommend that to anyone considering buying it. I just wish it were a little more generous in size. But I would buy it again, because I really love the pattern and the weight of the cotton fabric. It looks great! I purchased a king coverlet for my queen bed and its perfect. I am always hesitant purchasing items on line without seeing a product first but the quality and workmanship is of this product is excellent. The quilting in this coverlet is fantastic. Color also is what is shown in photos. I also purchased INK + IVY accent pillows and all products reflect the same excellent workmanship and quality. The pillows were left partially unzipped in packaging so you can examine the innermost pillow under the cover - which they are excellent as well. I would without question or hesitation buy from this manufacturer again. The color in the image is fairly representative of the actual color of the coverlet. It's only a slightly more vivid hue in person. What you can't see in the image is the contrast stitching, which is actually very nice. The reverse side of the coverlet is a slightly off-white fabric with the same darker ochre stitching on the reverse side. Both sides of the coverlet are quite lovely, and it's seemingly made very well. The king size covers a king size bed nicely, and it drapes along the sides of the bed beautifully. Color is true to the online image. The "yellow" is a cross between ocher and mustard. The quality is excellent for the price and the coverlet is heavier than it looks online. On my full-size bed, the full/queen size is perfect and the shams are roomy. Please note the set does NOT include a dust ruffle. The reversible white side (and it's white, not cream) has the same mustard-colored stitching and the elephants with their trunks up really pop. As good or better than pictured. Great quality, looks good on the double bed. It is a few inches smaller than many full/queen sizes, which is what I wanted for a double--and so i couldn't be more happy with it. Ordered an elephant pillow and the white and gold pillow from Ink and Ivy also. I purchased this for my full size bed. I have an iron bed that sits rather high off the floor so I purchased a California king to make sure that I had full coverage. I already own two queen-size coverlets the barely covered. I always left the side against the wall very short so that I had enough to cover the exposed side. This coverlet is excellent quality and I'm extremely satisfied with my purchase. After I washed it the first time it got that graeat puckered look of hand quilting and I love the little elephants in the pattern - the color is great too! It's exactly like the picture, a beautiful mustard color. You won't be disappointed. This is a beautiful, coverlet. The elephant detail is subtle and unique. Good quality and soft to the touch. Does not feel cheap or cheaply made. That being said, my set came with the yellow shams, and at first I thought they weren’t reversible. Upon further inspection, they ARE reversible, you just have to turn the whole thing inside out, not just flip it over. Guest love this stylish set! 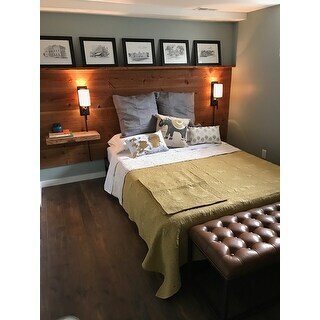 This set is nice quality and looks great in my guest room. It has lots of coordinating pillows and will look great in any room. I can't wait to reverse it and change the look! 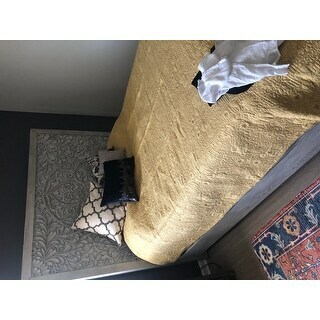 Lovely bedspread in a pleasing Gold color. The pattern is subtle and nice. Seems well made! The coverlet is well made, true to color shown and the reverse side is lovely. I am very pleased with the purchase. I love this coverlet. 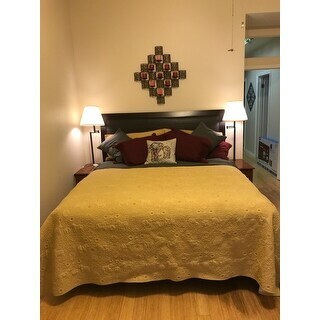 It looks great on the platform bed I just purchased. The elephant motif is terrific. It is subtle but elegant. 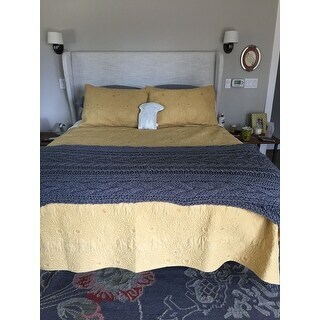 I'm very pleased with this purchase - the coverlet looks exactly the same in person as it does in the pictures. The color is exact and the stitching is very detailed. Would highly recommend buying. I love the color of this set. It is a creamy, buttery color with depth. It is a very good quality blanket and once washed it is nice and soft enough as a top cover. I purchased this coverlet set as a summer alternative to my winter down comforter. I have gotten many compliments on it and it has remained vibrant and in great condition after several years and many washes. Lovely quilt. The full/queen does not fit a queen bed. I had to return. I tried a king but it was way too big. I really love the pattern and color but didn’t cover for both sides of the bed. Would work great on a thinner mattress or full mattress. Love the quality and the elephants! It does seem a bit short for a king size, however. Elephants are huge, strong intelligent animals. The coverlet is perfect without being overbearing. It is neutral enough to compliment just about any décor yet bold enough to still make a statement. Very pretty coverlet set. I didnt expect the elephant detail in the coverlet but it just made it even better. I just loved the color. This is my favorite coverlet. Looks great in my room which has a lot of grays and yellows. I love it only wish I could get more shams! 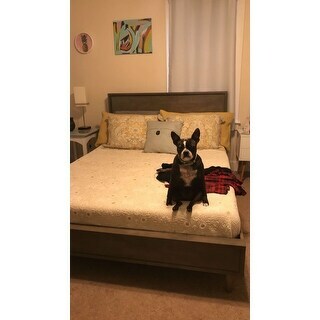 "Will the California king set fit my king sized bed? 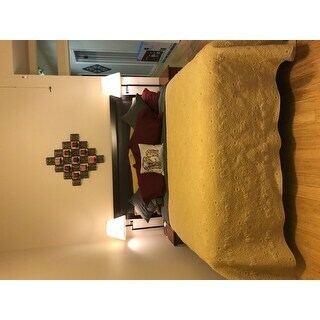 I am new to the king sized bed world, and I didn't know if they were inter changeable like a full/queen are." Yes, these will fit a king size. I bought the King size for my Queen bed and it fits perfectly because I wanted it to almost reach the floor on all sides. The Queen needed the addition of a dust ruffle. "In 2016 I see you did not carry the coordinating pillows. Do you happen to have them in stock or know how / where they can be purchased? This will weigh heavily in my decision to purchase. Thanks ;) "
"On the photos, when you see the reverse side of the pillow shams, they have the elephant print also. Mine does not. Is this a mistake? Can I get a pair that has the detailed elephants on the white side"
Contact us for help with your order at 1 (800) 843-2446. Reverse of shams is plain fabric with slit to slip in pillow. Otherwise the slit will split the quilted elephant pattern. You can actually turn the sham inside out and get the reverse effects!!! "is the color actually like a dusty gold or yellow"
"what is the return policy"
I live the color and original elephant quilt motif! Beautiful!!! I love sleeping under light weight cotton quilts, and was looking for one in gold. The color and the elephant detail made this a very unique option and convinced me to purchase. "Do you also carry the coordinating decorative pillows and shams? Specifically the brownish striped behind the Gold/yellow pillows." We do not currently offer coordinating pillows or shams for this set.